Re: Just these 5 then? They forgot the fluffing tin whistle. How do you do even accomplish that? But all silliness aside why are people so cruel to bodhran players? That’s just stupid. Why even bother writing an article like that? Not thought out at all at all. In their defense, they didn’t claim the article was comprehensive. # Posted by Kendrich 2 years ago . "In their defense, they didn’t claim the article was comprehensive." Incomprehensible then? To be honest, it appears to be some of the usual drivel meant to entice visitors, a population segment that’s unlikely to be deeply informed on the subject. I can’t imagine calling a six-string soup ladle a bouzouki though. The article is more or less harmless, but I’m surprised no one has jumped on the fact that the pipes pictured are the GHB, not the uilleann. That I cannot forgive! The uilleann pipes have been around since the 5th century? I’m no historian but I’m pretty sure that date is out by quite a few centuries. The "five instruments" I take to be like "five reasons to ____ " in other words not THE five instruments or the five ONLY instruments but a mere selection. As was pointed out above the "which have been around for centuries" part is absurd, regarding the bouzouki, at least in Ireland. The bodhran as we have it today is fairly recent, people say, but 100 years ago they were playing them, or tambourines anyhow. I’m told the word appears in ancient Irish literature but who knows what sort of instrument it was. Haha! So apparently highland pipes and baglamas are making inroads into the music! The images were definitely put together by someone who didn’t have much of a clue. Same might be said for the writing as well. I’m kind of surprised that it wasn’t an ad-baiting site, which makes you click through separate pages for each, just so it can throw 5 pages of ads at you. "These 5 exotic instruments that you’ve never seen before are amazing! Number 4 really took our breath away!" @callison: Maybe I’m just too nice of a guy. Just point out they never said that those 5 were the "only" or even "primary" instruments. That article, I will agree, is relatively silly. "Course, these sessioneers are Americans - but their drums look suspiciously like bodhrans, well over a hundred years ago"
If the photo is of actual Civil War soldiers there’s no reason to assume that they’re Americans. The Union Army, at least, had hundreds of thousands of immigrants in its ranks, entire Brigades and Divisions of immigrants, where the orders were given in German, or Irish, or Italian, and so forth. The Confederate Army not so much, but there were mixed-race Asian/white Officers in the Confederate Army, it would surprise many to know. I see the Irish bazouki has been played in Ireland for centuries after arriving in the 1960s. Time in Ireland must be different from elsewhere. I always suspected it. # Posted by Gallopede 2 years ago . "If the photo is of actual Civil War soldiers there’s no reason to assume that they’re Americans. " Yes, that thought occurred to me after I posted - some of those guys certainly look like they could be Irish, and there were plenty of Irish fighting for the South, I believe. As for the provenance (I learned that word from Antiques Road Show) of the photos, I forget where they came from - could have even been from this site. But they look far more authentic than most fakes - look how dirty everything is …..
Well, I’ll be hornswaggled - I got curious and just did a Google search. Here’s what Wicki says: "The 2nd South Carolina String Band is a band of Civil War re-enactors who recreate American popular music of the 1820s to 1860s with authentic instruments and in period style. 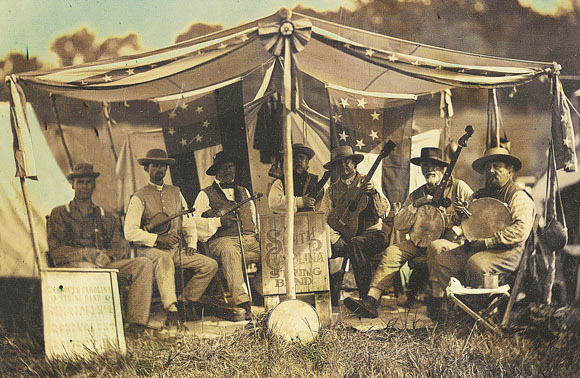 The group claims to "perform Civil War music as authentically as possible … as it truly sounded to the soldiers of the Civil War." Hey - this crow actually doesn’t taste half-bad! And can you pass over that humble pie? Thanks! "Course, these sessioneers are Americans - but their drums look suspiciously like bodhrans, well over a hundred years ago:"
That is a tambourine in the first photo. # Posted by ∅ 2 years ago . Isn’t a tambourine just a bodhran with jingly things on the sides? Or vice versa. Not long ago, I read some old-timer quoted as saying, ‘We used to call bodhrans "tambourines".’ Don’t know where that was; will pass along info. if I come across it again.